SYNOPSIS: With The Secrets of the Tudor Court, D. L. Bogdan gives readers the story of Mary Howard, presenting a new spin on an ever-fascinating tale, introducing obscure voices and perspectives to captivate the Tudor enthusiast. - Tudor England. The Secrets of the Tudor Court lends a unique window into history, telling the story of Henry VIII’s court and his ill-fated queens from the perspective of his little known daughter-in-law, Mary Howard. I'm not sure what to do with you Amy...of course you know I will just have to put this one TOO on my wish list!! So that's what the book is about. I kept seeing it arrive and now I get it. I don't know much about Henry Fitzroy's story and therefore Mary Howards. What a fun read. With all that went on in Henry VIII's court, there must be a wealth of stories yet to be discovered and written. I have this one on my TBR as well...always looking for a new perspective on an era I'm very familiar with. I do wish it had a different title...this is the same as Kate Emerson's series! 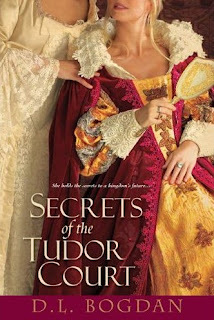 I don't know if I want to read anymore Tudor novels but I have to have this one just for the cover. It's beautiful!